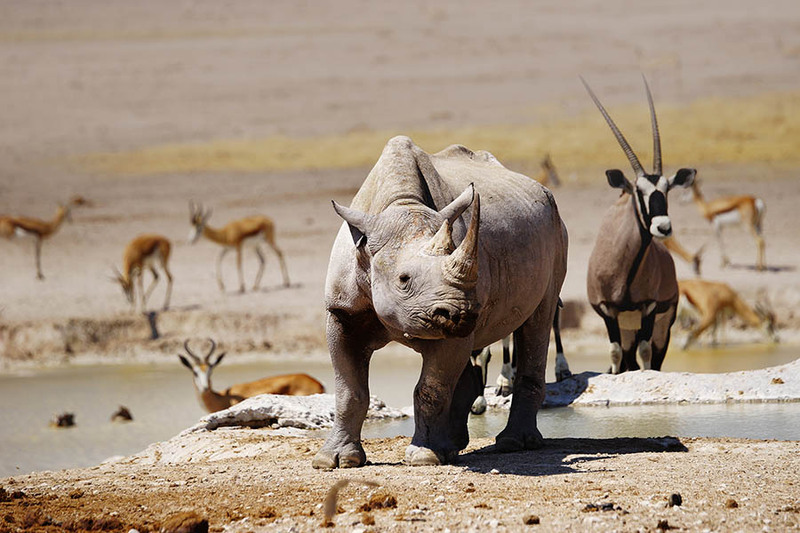 Explore the wild landscape and deserts of southern Namibia on this 9 day self-drive. You’ll drive south from Windhoek through the cactus-strewn scenery of the Kalahari Desert before the awe-inspiring views from the rim of Africa’s largest canyon - the Fish River Canyon. Discover the country’s colonial history in Luderitz before climbing the spectacular, orange dunes of Sossusvlei and witnessing the iconic Dead Vlei. Finish in the seaside town of Swakopmund where you can taste local Namibian oysters or take a dolphin cruise along the coast – the perfect way to experience southern Namibia. On arrival in Windhoek you’ll be met at the airport and assisted in picking up your hire car before driving south into the Kalahari Desert. 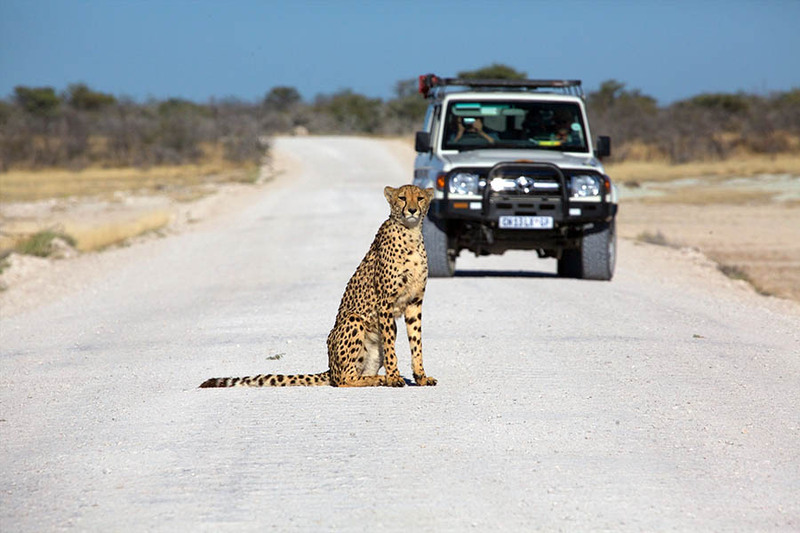 Endless grass plains and sand dunes are dotted with the few animals that can survive here including oryx, springbok and ostriches and your drive will take you past acacia trees and cactuses towards your hotel, Intu Africa Camelthorn Lodge, where you will check in for one night. Leaving the Kalahari behind, this morning you’ll drive towards the Quiver Tree Forest where 250 of the spikily beautiful trees are a photographer’s dream. Driving on you’ll arrive at Fish River Canyon, a vast crack through the earth which legend says was created by the whiplash of a dragon’s tail. One you’ve arrived, check into the Canyon Village for the night, ready to explore the canyon tomorrow. Today, you’ll visit the Fish River Canyon Viewpoint, where the steep layers of rock change from deep browns to rusty orange in colour. The Fish River has carved its way through the landscape over millions of years to create the largest canyon in Africa – why not hike a little way along the rim or simply enjoy the views down into the abyss? Driving towards Luderitz you’ll pass through the barren plains of Garub on the edge of the Namib Desert where small groups of wild horses roam the desert – look out for them as you drive through the area. Arriving in Luderitz you’ll check into the Nest Hotel for two nights. With a day to explore the area, you can visit the Komanskop Ghost Town, which was once a prosperous diamond town but is now being slowly reclaimed by the desert as the colonial buildings are filled with sand and are destroyed by the wind. You could also visit Diaz point, where in 1488 a Portuguese sailor marked the furthest south a European had ever travelled in Africa with a cross – today you can see a replica of the original cross which stood for 400 years. In the evening, why not try some delicious Namibian oysters? Today is a long driving day, so set off early to get a good head start. You’ll drive alongside striking mountain ranges and endless plains towards the Namib Desert where you’ll be staying at the Namib Desert Lodge for two nights. Today you can drive to Sossusvlei, where the red dunes, black trees and white salt pans make up the most iconic views of Namibia. Set off early so you can experience the sunrise, where the orange sands turn deep red and purple colours at dawn. 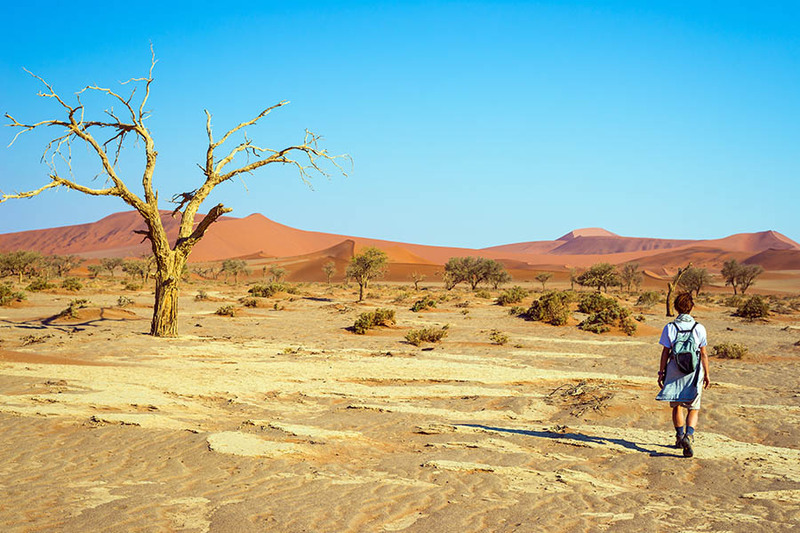 Next, you’ll visit the deadvlei, where acacia trees are believed to have died over 650 years ago but will not rot as the air is so dry. Today is sure to be a highlight of your trip to Namibia. In the morning you’ll drive to Swakopmund to enjoy two days in this pretty seaside town full of German architecture and delicious seafood. 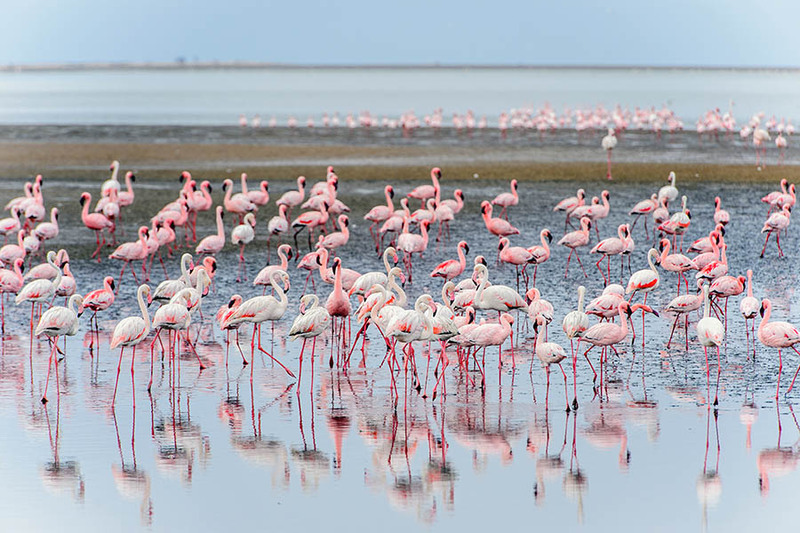 In Swakopmund you can enjoy dolphin cruises and kayaking before driving half an hour down the coast to Walvis Bay where a pink flurry of flamingos fill the lagoon. If you want to venture out of town, visit the Moon Landscape of the Swakop River, where furrowed rocks created a beautiful view and the Welwitschia Plains, where the bizzare welwitschia plant grows in abundance. Today is your final day in Namibia. Leave Swakopmund behind and drive back to Windhoek where you’ll return your hire car and catch your onwards flight. 8 nights in 3/3.5* standard accommodation.